We’re a Catholic not for profit organisation, providing services to 7,600 people across Victoria. Here at VMCH, our services are as diverse as the people we support. Our values underpin the work we do. As a Catholic not for profit organisation, compassion, respect and inclusion aren’t just words to us, they guide us in everything we do. While we’ve been around for over a century, we’re always moving forward. Always staying true to who we are by supporting people and families to live their best lives; providing a place to call home and spaces to learn and grow. Our professional and compassionate teams are with you on your life journey; helping you with a wide range of support from early learning and therapy, specialist education, disability services, affordable homes, residential aged care, retirement living and at-home aged care. 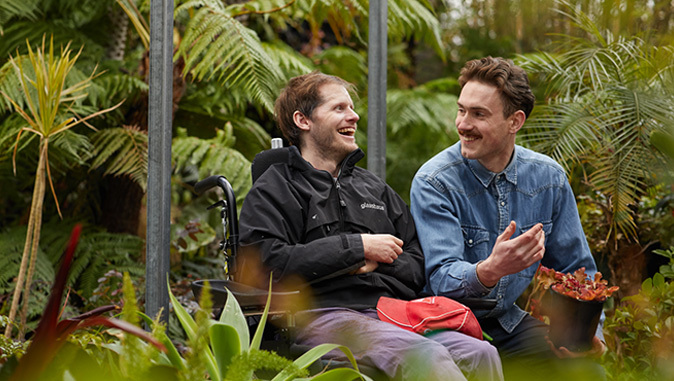 We’ve set our sights to be the Catholic Archdiocese of Melbourne’s leading provider of high quality specialist education, disability services, affordable homes, residential aged care, retirement living, at-home aged care and disability. We want to continue the caring ministry of Jesus. And we want to do it by creating choices, offering hospitality and building inclusive, compassionate and sustainable communities. We are especially committed to people who are disadvantaged and marginalised. As a Catholic organisation we observe the teachings and practices of the Catholic Church by celebrating the life of individuals and their communities as expressed in their physical, social and spiritual wellbeing. We recognise and respect the dignity and uniqueness of each person. We truly care and are always open to the needs of others. We are honest and transparent in all our dealings and accountable for all our actions. We are welcoming inclusive and responsive in our hospitality and services. We empower people, realise potential and maximise the outcomes from our work. We value the resources for which we are responsible, and commit to their effective and efficient use to achieve our Mission. VMCH acknowledges the traditional custodians of this land and pays respect to the cultural heritage, customs and beliefs of all Indigenous people.